The Dutch East India Company (VOC) established Cape Town as a refuelling station in 1652 for their ships sailing between Europe and India. As a result, ‘the mother city’ is the centre for historical archaeology in southern Africa. Historical archaeologists use documents such as probate records in conjunction with archaeological data from such places as wells and cellars to understand domestic life in early Cape Town. They study military life from the remains at outposts and in the Castle (see forts and military sites). Recently, an historic cemetery, now known as Prestwich Place, made the news. Development activities in 2003 uncovered a huge burial ground in the former District 1, incorporating the Waterfront and Green Point. In the 1700 and 1800s, the authorities used this extensive area as a burial ground for the colonial underclass, including slaves, servants, sailors, Khoe (KhoiKhoi) and free Blacks. Chemical analyses showed that some Black labourers came from as far north as Mozambique. An ossuary, the Prestwich Memorial, celebrates the contribution of all these people to Cape Town. After Vasco de Gama rounded the Cape in 1498, European ships stopped in Table Bay to take on water and fresh produce. Among other things, they traded for cattle and sheep from Khoe (KhoiKhoi) pastoralists. The Dutch called these people ‘Hottentots’, but the people themselves used such names as Chainoouqua, Cochoqua and Namaqua. Further north in the mountains, Dutch explorers met small hunter-gatherers called Sonqua by their Khoe guides. Later, these cattle-less people became known as the 'Bushmen' and 'San'. The distinction between Khoe pastoralists and San hunter-gatherers has been a topic of debate for many years. Some archaeologists and historians argue that there was a single continuum: when people kept livestock they were Khoe (KhoiKhoi); when they did not, for whatever reason, they were San. Others, on the other hand, argue that San without domestic stock were true hunter-gatherers who had a different lifeway, ideology and language. Whatever the distinction, members of both groups probably practiced ‘strandloping’, that is, they moved along the coast exploiting the varied marine resources available in different seasons and at different times. The huge number of shell middens in the Western and Eastern Cape bear testimony to this practice. The origin of Khoe (KhoiKhoi) pastoralism in the Cape is also a topic of much debate. The first domestic animals, mostly sheep, appear in several archaeological deposits dating to about 2000 years ago. Their widespread distribution at the same time suggests a rapid movement. It is unclear, however, whether full-time pastoralists from East Africa brought these animals to the Cape, or whether the animals were traded down the subcontinent between hunter-gatherer groups. In this last case, true pastoralism, as observed by the Dutch, would have developed locally through the centuries. Research, unfortunately, is severely hampered by poor preservation in temporary campsites. This paper was written for SAHO in 2010 by Prof TN Huffman from the Archaeology Department at the University of the Witwatersrand. • Parkington, J. 2006. 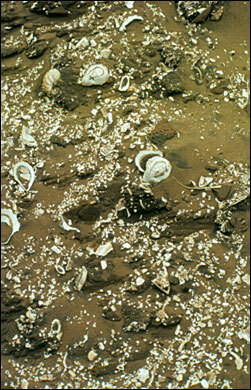 Shorelines, Strandlopers and Shell Middens. Cape Town: Krakadouw Trust. • Sadr, K. and F-X. Fauvelle-Aymar (eds) 2008. Khoekhoe and the origins of herding in southern Africa. Southern African Humanities 20: 1”“248.